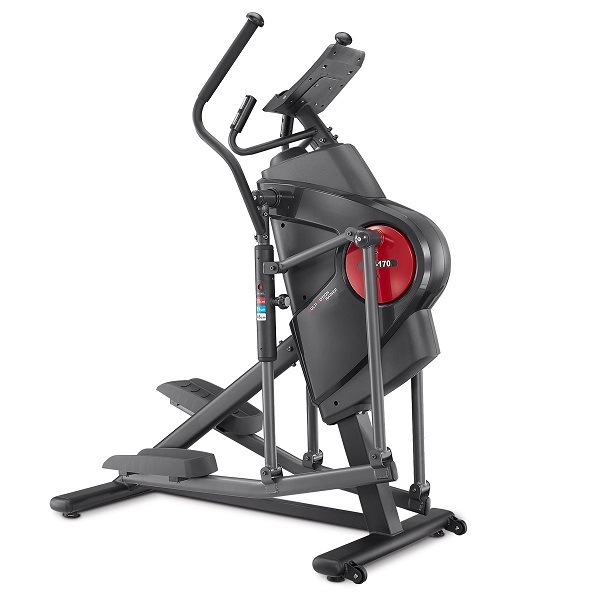 HealthRider is a newly introduced brand into the UK marketplace and is manufactured by the world’s largest fitness equipment manufacturer: Icon Health & Fitness – the people behind the ProForm and NordicTrack brands. 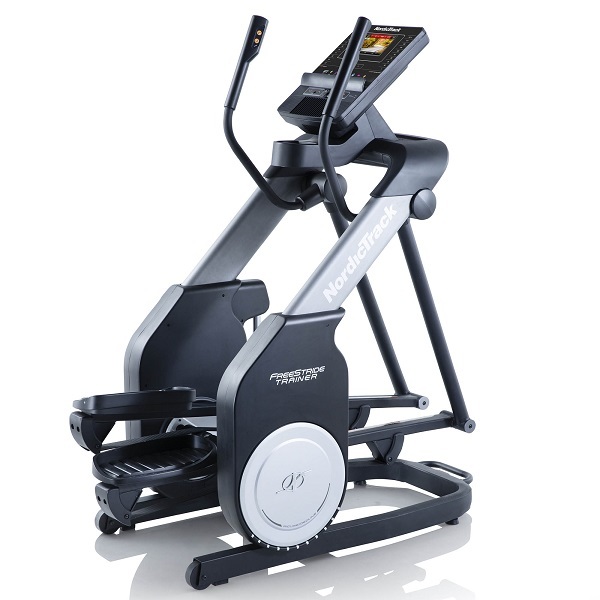 The 950 elliptical trainer is the entry level elliptical in the range and with such a big manufacturer behind it, we were eager to get our hands on it and see how it stacks up! Like most cross trainers, the assembly is quite fiddly and takes an hour or so. Key thing is to take the all the pieces out of the box and to simply follow the instructions step by step. We can confirm the instruction manual is actually pretty clear with respect to assembly. Having assembled the machine, our first thought was that visually, it’s quite a dull looking elliptical. 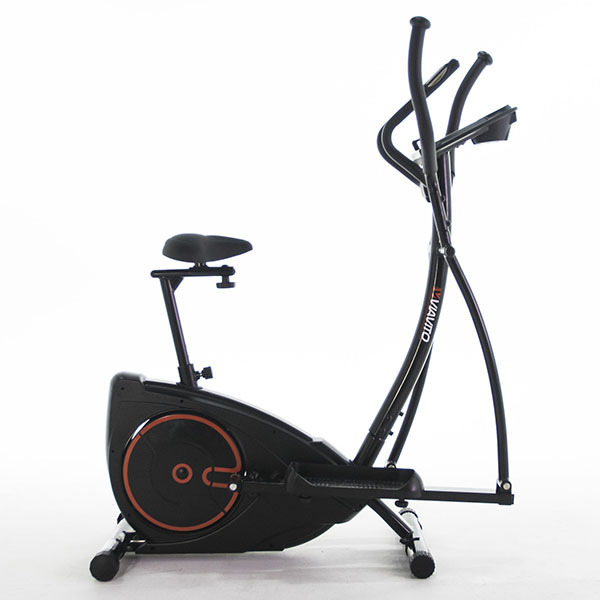 So, we know that this won’t be winning any visual design awards, but then again, an elliptical is there to be used and provide a good workout, rather than be stared at as an object of beauty! So, what’s it like to use? Thankfully, the feel and action of the 950 is in stark contrast to the look of the product! 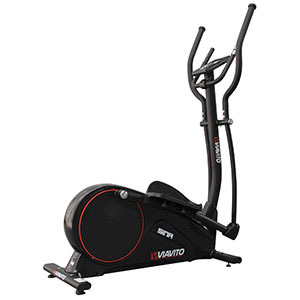 Fitted with a hefty 12kg (31 lb) flywheel and a decent 16″ (41 cm) stride length, this has the feel of an elliptical that should be in a higher price bracket. 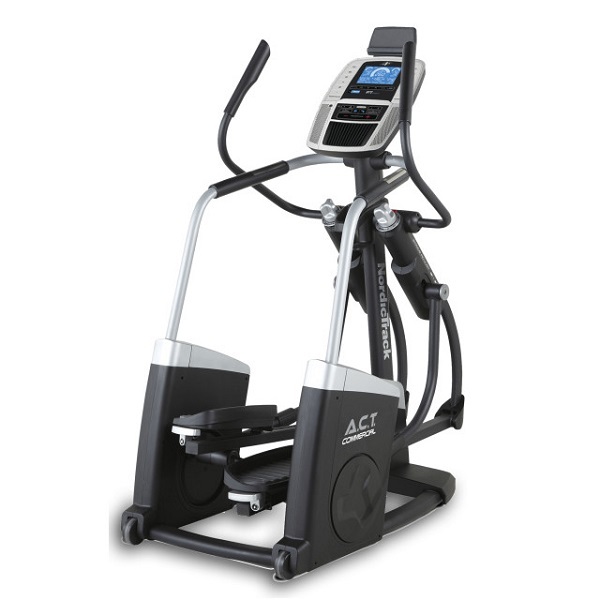 The action is smooth and with the cross trainer itself weighing in at over 50kg, it’s nice and sturdy to use as well. The HealthRider 950 has a large console with a back-lit LCD display in the middle. On first glance, it looks very feature rich (a.k.a complicated!) with a lot of buttons and options. 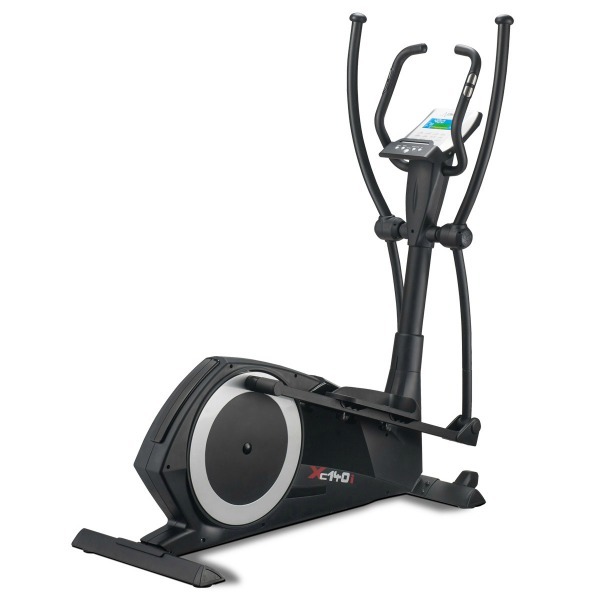 One thing we really did like about this cross trainer was that it’s possible to get started by just jumping on the machine, start striding and just adjust the resistance using either the quick keys on the console or the resistance up and down buttons. First appearances can be deceiving and our initial impression of the console being complicated were a case of us jumping to conclusions too quickly! 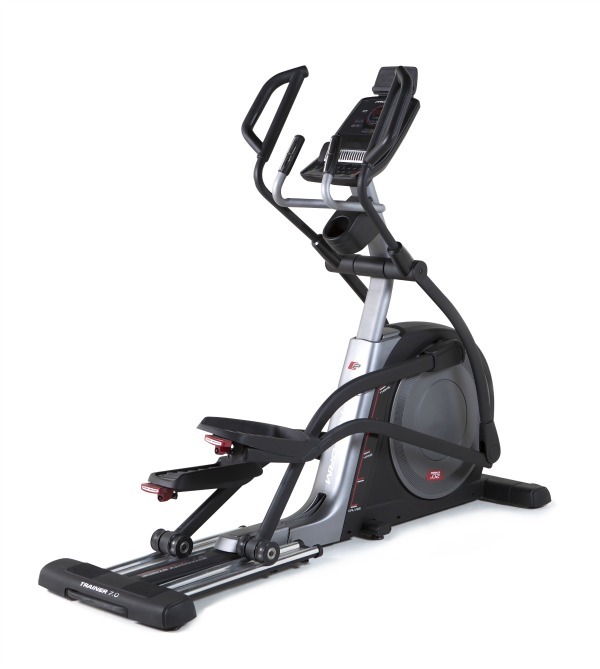 We already mentioned the quick resistance buttons: this is something that’s really handy for those doing interval training as it allows you to jump from top resistance to low resistance with a single button press, rather than hitting the resistance up or down key repeatedly as you’d need to on pretty much all other elliptical trainers. In terms of programmes, there are 20 built-in work outs, divided up into speed and calorie goal workouts. As each is selected (using the dedicated speed or calorie programme buttons), the resistance profile of the programme, as well as its duration is displayed on the LCD display. Of course, it’s impossible to use this machine without noticing all the buttons on there relating to iFit. 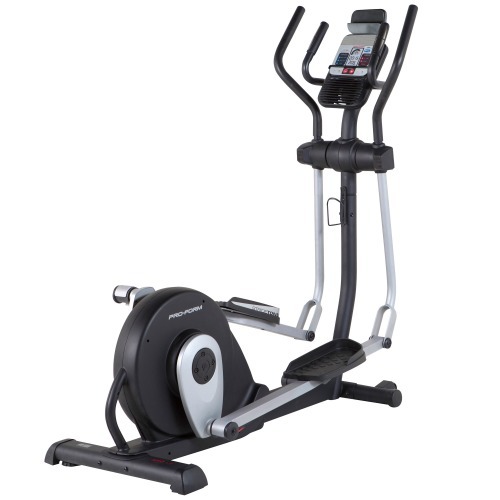 Surprisingly for such a low priced machine, this elliptical’s console is iFit Live compatible. For more information on iFit Live, we’d suggest checking out the iFit.com website. To make use of this functionality, you do need to purchase a wireless iFit module as well as a subscription to the service (typically around £100 for a module and a year’s subscription) and this opens up a whole world of interactive training! We’ve played around with iFit live a fair bit as we’ve reviewed different machines and it is definitely a ‘nice to have’. 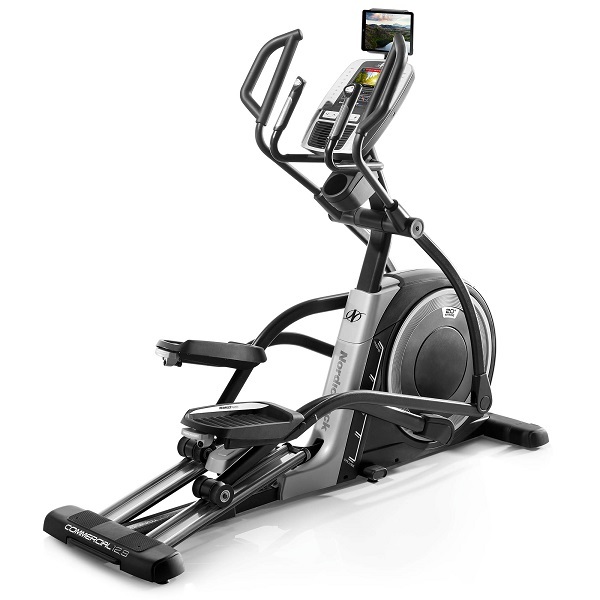 But let’s be clear: this is an elliptical that’s perfectly usable and provides a very decent workout without using the iFit functionality that requires a module and a subscription. Putting aside the iFit Live side of things, there are quite a few nice little touches on this console. We particularly like the fact that there is a simple button called “settings” that lets you configure a load of different things simply and easily. For example, changing the console to switch between imperial and metric units of measure can be done easily in the settings (though weirdly the imperial option is named ‘english’). On so many other machines, making this change (if even available!) requires switching into an engineer mode on the console through a weird combination of buttons being held. In addition to this, other settings which can be configured include changing the contrast of the display, which is quite useful if the machine is being used by users of different height. Finally, on the positives of the console: it’s possible to toggle the feedback being displayed and one of the options includes showing the number of rate of calorie burn / hour that the current tension and striding speed would equate to. So, it’s clear that this console has a LOT to offer, but let’s be clear: it does also have compromises. The two main ones are that it doesn’t have a wireless heart rate receiver built in, so if you’re wanting to do heart rate controlled training, this isn’t the right choice and the second is that getting personalised (to your specific gender, weight and height) calorie consumption figures can only be done using the optional iFit Live as there are no built-in user profiles on the console. 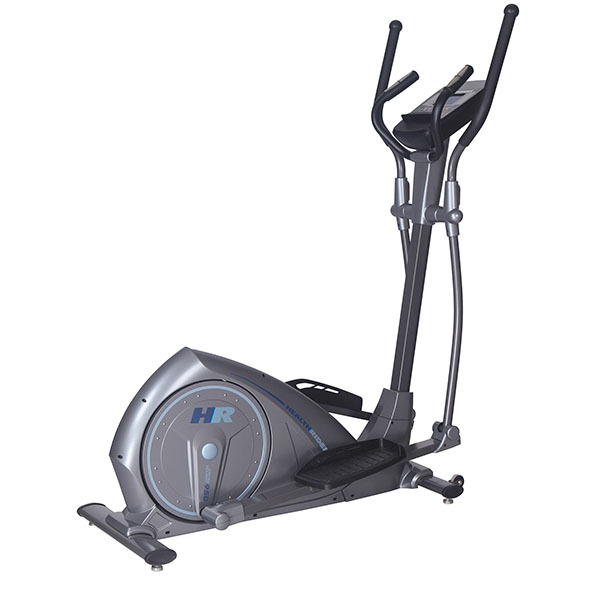 The elliptical has a decent maximum user weight of 115kg and a 2 year parts and labour warranty in case something goes wrong. Please do note, however, that you do need to register the machine with the manufacturers within 28 days of purchase to get the 2nd year of the warranty. The HealthRider 950 is not currently available from any retailers we're aware of in the UK.